Alienware has revamped its range of gaming laptops with new designs, new graphics and Intel's latest-generation Haswell Core processors. The three new models are simply called the Alienware 14, Alienware 17 and Alienware 18 (relating to their respective screen sizes) and feature a new angular design across the range. Alienware reckons it's inspired by "jet engines and stealth bombers", though we're not really sure of the connection there aside from the fact all three laptops are black and they're mostly metal. Indeed, over 60 percent of the main mechanical components are metallic including the anodised aluminium shell and the magnesium alloy body. High bandwidth DDR3L memory is also used, which has lower voltage requirements to increase battery life. Storage is also plentiful, with support for up to three storage drives on the Alienware 14, and up to four storage drives on the Alienware 17 and 18. The laptops all feature Ethernet technology by Qualcomm's Killer networks as well as Klipsch speakers and Dolby Home Theater v4 audio. You can choose between Windows 7 Home Premium and Windows 8 as the operating system. 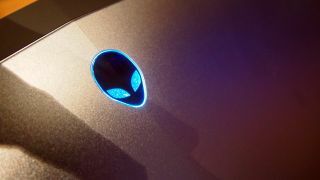 Alienware has introduced several other new enhancements based on feedback including a metal plate behind the soft keyboard to improve typing, while the Alienware 14 features an anti-glare wide-angle LCD display – all three laptops have HD displays and the Alienware 17 can be specified with a 3D screen. And, as you'd expect from Alienware, you can customise all of the lighting across the case. We were told how many lighting combinations you can have, but we've forgotten how many it was as it was so big. Millions. The Alienware 14 starts at £1,099 (USD $1712, AUD $1,820), with availability of the Alienware 17 and 18 set to follow. We'll have hands on reviews of all three laptops later today on TechRadar, but in the meantime find out more about Intel's latest-generation Haswell processors.